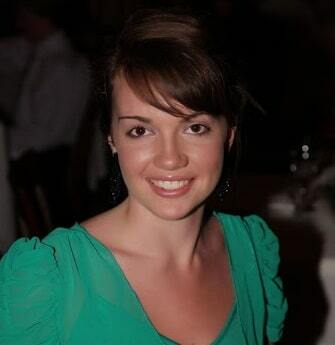 My name is Claire and I created this site with my partner. Our initial aim was to research the prices tradespeople and businesses are charging for home improvement projects. Since our launch, we’ve also created some helpful guides for specific causes that we’re passionate about. Two years ago my dad died from mesothelioma; a cancer caused by asbestos exposure whilst working in the construction industry decades ago. My partner, who previously served with the armed forces also worked in the home improvement sector after leaving the army. We put our heads together, researched this topic extensively and created this guide for homeowners, renters, DIYers and tradespeople. 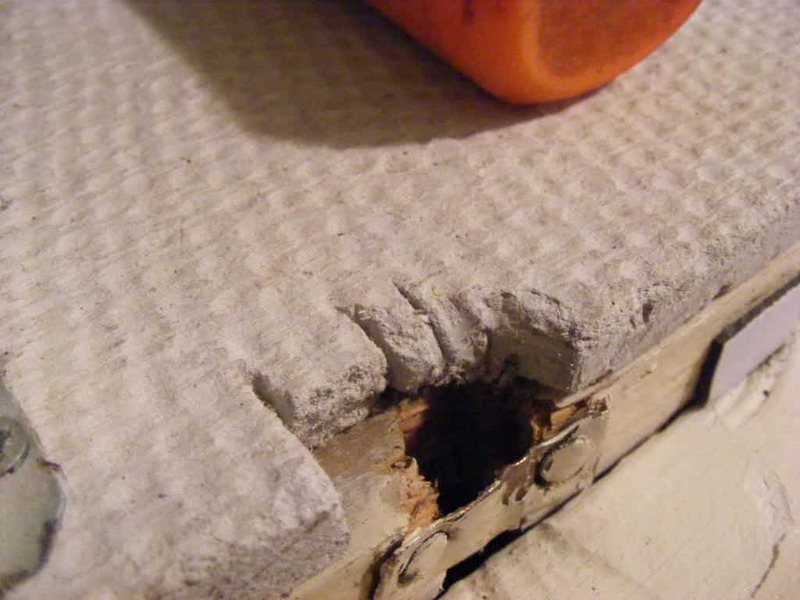 We’ve done research into exactly where and when asbestos products were installed into homes. With our help, we hope you can easily identify and steer clear of this dangerous material. While this guide is not intended as an alternative to asbestos analysis testing, it can help you avoid potential asbestos-containing products. You’ll find photos, descriptions and risks for each of the eight common places to find asbestos in the home. Risk chart from the HSE. Published in 2013. Asbestos – How Many Homes Contain it? Did you know that a recent survey revealed that over 50% of homes constructed before 1998 contained asbestos products in at least one location? Asbestos comes in several forms and can be added to other materials such as cement or plaster to harden and heatproof them. The reason this material was so popular was that it’s cheap to manufacture and easy to work with, it also lasts for hundreds of years as it doesn’t degrade over time. But what does asbestos look like and wherein the home are you likely to find it? 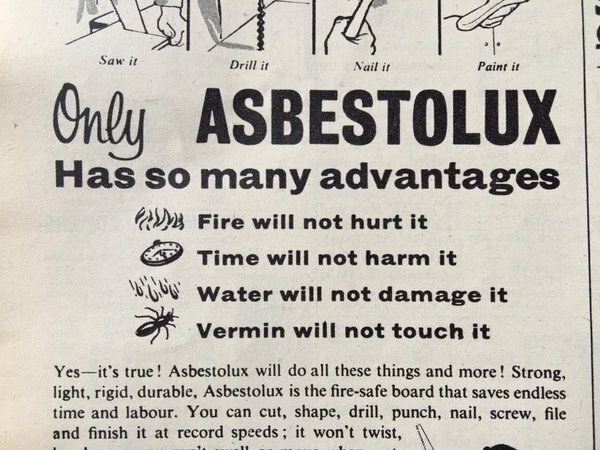 Asbestos was once a very popular material but its use declined from the early 1980’s until 1999 when its sale was finally banned. Unfortunately, the latency period for asbestos-related cancers is between 15 and 40 years after exposure. 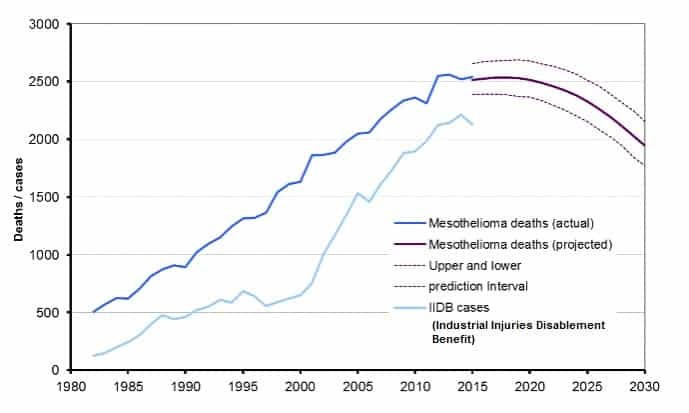 UK Mesothelioma deaths by year. US deaths are even higher. Don’t forget that this is just one type of cancer caused by asbestos. Here’s our guide to asbestos in the home, we’ll show you photos of each product, a description and details about where you’re most likely to find it. As a bonus, we’ll also disclose how likely each material is to shed harmful fibres. This a great resource and could save your life so don’t forget to bookmark this page or share on your favourite social platform. What’s best, asbestos removal or sealing/encapsulation? Soffit boards are located on the roofline of many houses and intersect with fascia boards. Solid wood soffits were popular up to the 1940’s. After the second world war, there was a shortage of certain products such as metal and wood. Thus cheap cement based products were used as alternatives. 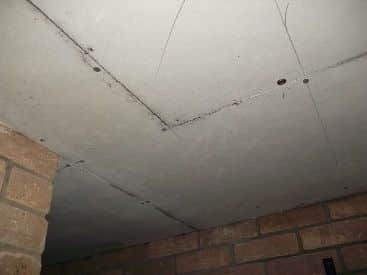 Builders used asbestos cement soffit boards, called Asbestolux, Asbestos Cement Mix (ACM) or Asbestos Insulating Boards (AIB) from the late 1940’s up to the early 1980’s. 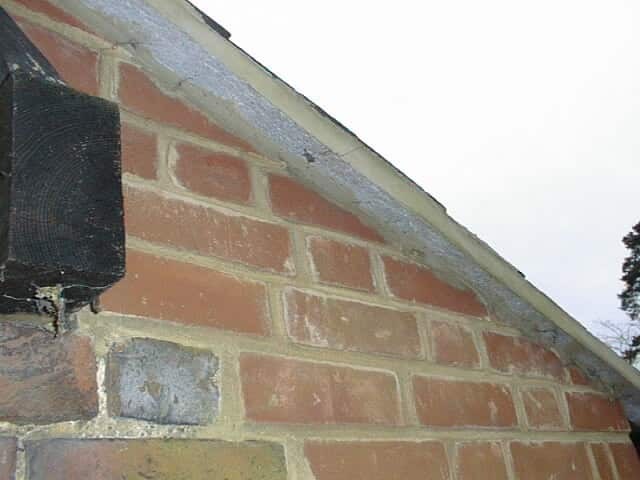 From the early 1980’s, thin ply board gradually replaced asbestos as the preferred choice for soffits, this was, in part, due to the introduction of asbestos control regulations. The 1990’s saw the introduction of Upvc plastics which required less maintenance and lasted longer. Once painted, asbestos soffit boards look just like ply boards. The reason we have chosen soffits for our #1 slot is that hundreds of thousands of homes still have these boards on their rooflines and previous homeowners may have covered them in layers of paint, which masks the fact that it’s asbestos. The only good thing to say about asbestos soffits is that they’re located outside, and the dangerous material is mixed with cement, so poses little risk if left undisturbed. These panels were incredibly popular up to the late 1980’s and can be found on millions of shed and garage roofs in the UK. They were cheap, easy and quick to install, didn’t catch fire and lasted for hundreds of years. You’ve probably seen many of these products yourself, they’re found everywhere. Because they’re found in garages and sheds, there is a risk of fibres accumulating on the floor of the garage/shed, and this is the main risk to you. As a general rule of thumb, asbestos indoors or in any area that isn’t well ventilated is far more dangerous than asbestos in an open air environment. We recommend you either call a professional to remove these sheets and replace them with an alternative product or have them sealed so that they won’t leach dangerous fibres. Asbestos has incredible fire and heat proofing properties, it was widely used as brake pads on trains, as a fire barrier on navy ships. It doesn’t conduct electricity either so can be found near fuse boards and consumer units. While these products are often found in the home, they pose little risk if left undisturbed. Unfortunately, if the home owner or resident doesn’t know that they’re asbestos, they may inadvertently drill, cut or remove them, releasing dangerous fibres into the home. Small sections of asbestos heat shielding, such as those found behind fuse boxes or chimney breasts, are relatively inexpensive to remove and a professional could complete this work in less than half a day. 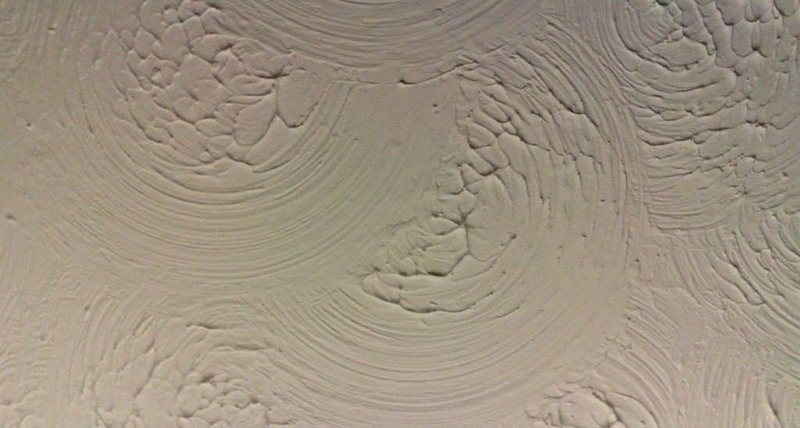 Textured wall and ceiling coatings have been around for decades but became fashionable during the 1970’s and 1980’s. Asbestos was frequently added to the mixture to make the material firmer and easier to work with. Because of the fireproofing benefits of asbestos, you often see this stuff on kitchen ceilings. Asbestos wall coatings are less common, but if you have this material in the ceiling, it’s worth having the walls tested too, especially in areas near sources of heat. The biggest risk to you is drilling, sanding, cutting or removing this material. This would release a considerable amount of asbestos fibres, so any substantial work must be done by a fully licensed asbestos remover. Low-risk work, such as drilling a hole or two, may be done by unlicensed persons who have completed an asbestos awareness training course. Because this material is located indoors and often covers the entire ceiling, the risk factor is very high, although many homes have now had their asbestos ceiling removed or safely encapsulated. Car ports pose a risk to any rooms located above the port, spilt fuel or oil could catch alight, or an engine fault could cause a fire and burn through into the house. For this reason, building regulations state that fireproofing material should be placed on the ceiling of all car ports underneath habitable parts of the home. 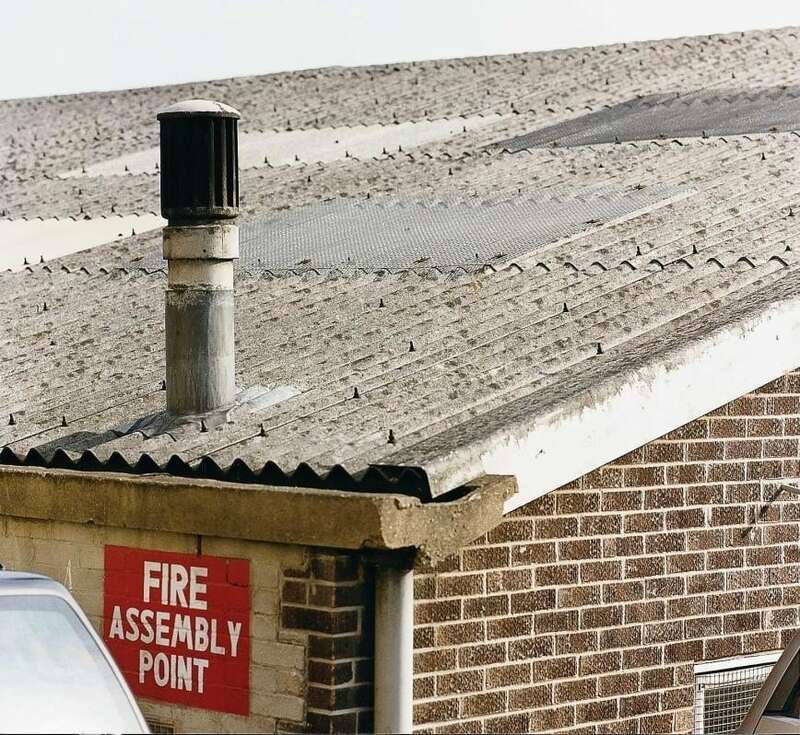 As asbestos has incredible heat shielding and fire proofing properties, it was seen as a perfect option for car port fire protection. Like similar asbestos products, previous homeowners could have painted over them, making it difficult to detect. If your property is more than 20 years old and has a gable, the chances are that the cement on the roof edge is supported by an asbestos containing board called an undercloak. The bad news is that these boards look identical to non-asbestos boards that have been used as an alternative for the last 30 years or so. To confirm whether any undercloaks on your home contain asbestos, you would first need to have a sample tested. The good news is that this asbestos product is found outdoors and as you can see from the photo, is embedded into cement. 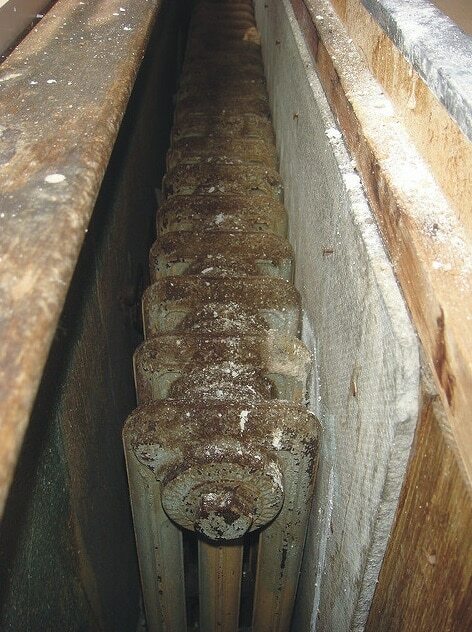 This type of asbestos is a very low-risk product, although dangerous fibres could be released if it’s disturbed. Flues can be found on top of chimneys, on breather pipes for toilet waste systems and even on external outlets or hoods for gas boilers. They were very popular due to their heat shielding properties which made them perfect for chimney tops. 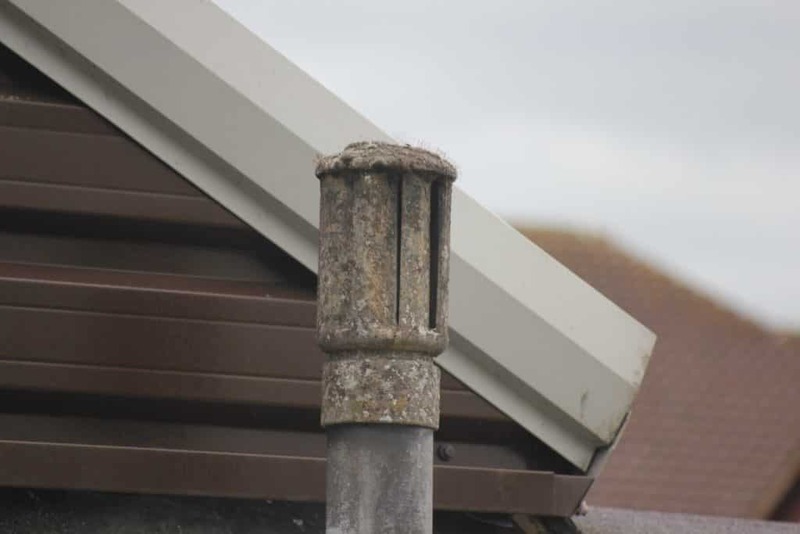 The good news is that these flues are always found outside so pose little risk unless disturbed. They are also easy for a professional or trained person to remove; the main issue is gaining access to them as some chimneys are very high. On some homes, the entire pipe, from ground level to the roof, is made from asbestos. These are most costly and difficult to remove but are rarely found. These tiles were used on ceilings and are almost always square or rectangular. “Drop in” tiles that workers lay into a hung ceiling are very common in offices, commercial buildings and communal areas of flats and apartments, they’re not seen very often inside the home. adhered tiles are more traditional in that they’re fixed to the ceiling with an adhesive. Unfortunately, both types of tile look very similar to non-asbestos alternative products. The only way you can be 100% sure is if you have the tile tested. Hanging tiles are very easy for a professional to remove, they aren’t fixed with nails or screws so should come in one piece. Adhered tiles often break apart during the removal process, so a professional may charge more for this type of asbestos. Adhered tiles can be covered with an additional ceiling to box them in; this is a realistic, safe and cost effective alternative to removing the material. What’s Best – Remove Asbestos or Seal it? Many homeowners choose to leave asbestos in place and hire a professional to seal or box it in. This prevents any harmful fibres from being released and is an attractive option. Garage roof sheets can be sealed by a professional, this sealant lasts up to 25 years and prevents fibres from being released. 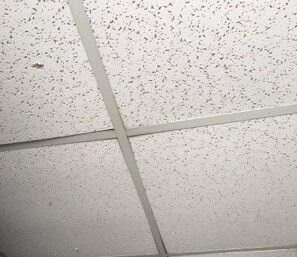 Ceiling tiles or Artex can be left in place, and a separate ceiling hung directly below it and finished with a traditional plaster finish. 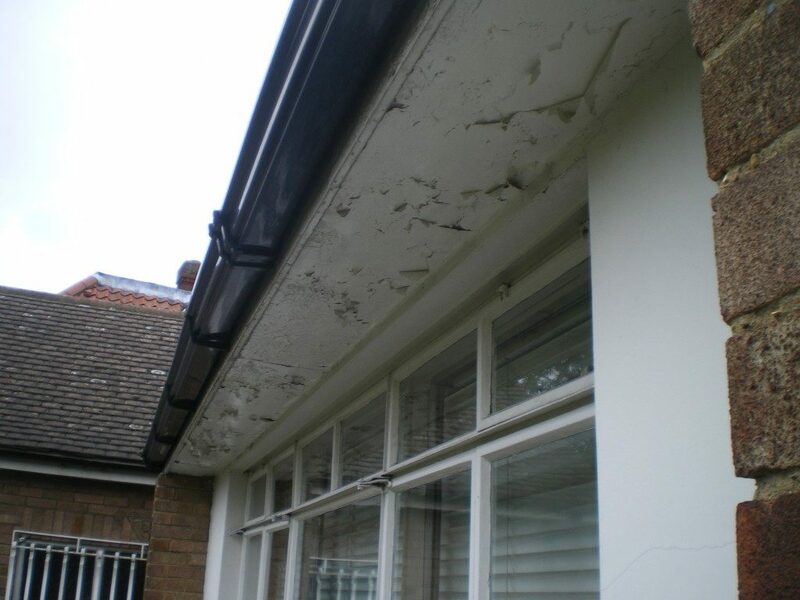 Soffit boards can be painted by a professional and left in place; they don’t pose any risk if left undisturbed. an accident such as a ceiling collapse could release dangerous amounts of fibres. having asbestos in the home could make selling the property more difficult. regulations regarding historical asbestos may change in the future. When we created this website, we did have a section here revealing how much it costs to remove asbestos. This was based on quotes and feedback from asbestos removal companies. 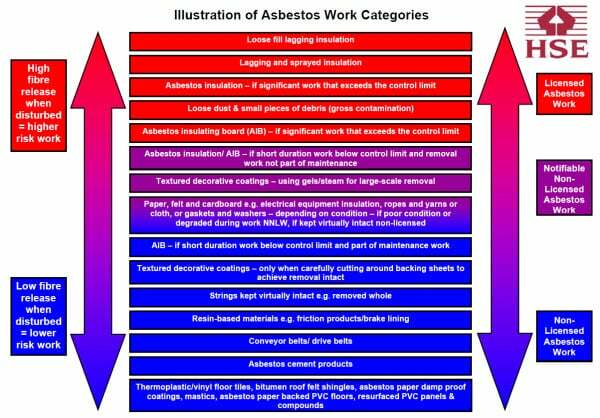 Here you’ll find an in-depth guide asbestos removal costs. This page has prices for removing asbestos sheets from a garage roof.